Center for Independent Futures understands the challenges organizations, schools, and agencies face. And our expertise is a phone call away. When you work with us, you have access to a staff with strong professional credentials in education and social work who have consulted with school and agencies throughout the region. We know students and adults need to be prepared for the future, and laws and rules need to be satisfied. All this must be accomplished with increasingly tight budgets. 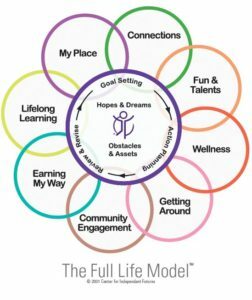 Our person-centered approach accomplishes these goals and readies individuals to live more full and independent lives. The cornerstone of our approach is the pursuit of a full life. With My Full Life™, schools can provide more efficient and cost-effective transition services than if they created a comprehensive curriculum themselves. We prepare students for life, not just the next set of “special needs” services. For organizations, My Full Life™ provides a person-centered approach that aligns with accepted best practices. Along the way, we provide ongoing training and consultation to schools and agencies, working together to make a difference in the lives of individuals and students. We created the My Full Life™ solution to align to Indicator 13 of the Individuals with Disabilities Education Act, and it satisfies the person-centered planning rules of Medicare. First, we listen to an individual’s hopes and dreams and help them create a plan—for students, this plan becomes measurable post-secondary goals. Then, we look at the individual’s abilities and determine where new skills are needed by performing age-appropriate assessments. Finally, it’s time to learn. We create a plan to learn transition skills and reach goals. For educators and agency professionals, this process simplifies the writing of annual IEP and ISP goals required by law. With hopes and dreams at its center, The Full Life Model™ is the prism through which we view each individual. The eight essential aspects of a full life are integral to our person-centered Planning Process, Skills Inventory, and Skills Training. Fill in the information below to learn more about how to put My Full Life™ to work in your organization! Our exclusive online application documents an individual's goals and plans and monitors achievement. 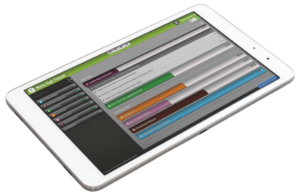 Instructors, administrators, and individuals can use a computer or mobile device to set specific goals, create action plans, and track progress. Using My Full LifeTM, students and individuals determine their own paths, become more independent, and engage in the world around them. ...all delivered in an easy-to-use, web-based application.